Borgaonkar showed that a device can be forced to automatically open a link to such a page by touching a NFC-enabled phone to a rogue NFC tag, by scanning a QR code or by including the link in a special service message. However, an attacker can also include the link in a Twitter feed, SMS or an e-mail message and trick the victim to manually click on it. This is possible because of a MMI code that allows changing a SIM card's PIN (Personal Identity Number) number using the PUK (Personal Unblocking Key), Collin Mulliner, a mobile security researcher who works in the SECLAB at Northeastern University in Boston, said Tuesday via e-mail. 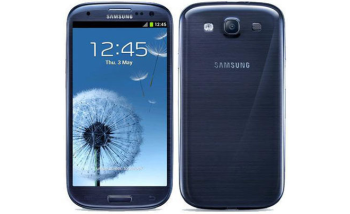 Samsung has already fixed the USSD/MMI code execution issue for Galaxy S III devices. "We would like to assure customers that the recent security issue affecting the Galaxy S III has already been addressed in a software update," Samsung said Tuesday in a statement via e-mail. "We believe this issue was isolated to early production devices, and devices currently available are not affected by this issue. To ensure customers are fully protected, Samsung advises checking for software updates through the 'Settings: About device: Software update' menu. We are in the process of evaluating other Galaxy models."